[INFO] 130504 [MWAVE POLL] What type of Idol Star is perfect for you? Because of his "Little Devilish" type of character, Hongki got the first place for the “Perfect Type of Idol star"
Re: [INFO] 130504 [MWAVE POLL] What type of Idol Star is perfect for you? 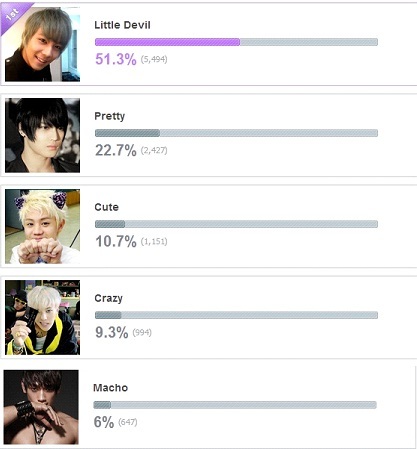 Hongstar doing well in the polls even he's been labeled "Little Devil"
Haha. Oo nga po! Bagay naman.. Badboy look.